Karnataka Chief Minister HD Kumaraswamy met the relatives of the victims and assured them all possible help from the government. He said that prima facie poor quality of work seemed to be the cause for the disaster. 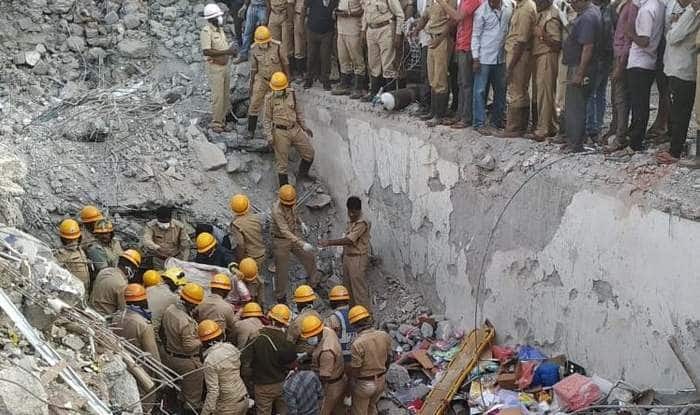 Bengaluru: The death toll in the Dharwad building collapse rose to 14 on Friday. At least 56 people have been rescued until now but 12 are still missing. With the rescue operations continuing for the fourth straight day, it is feared that nearly 10 people might be trapped under the debris. Karnataka Chief Minister HD Kumaraswamy visited the site in Kumareshwar Nagar and checked the rescue operation being carried out by both the National Disaster Response Force (NDRF) and State Disaster Response Force (SDRF) teams. Kumaraswamy also met the relatives of the victims and assured them all possible help from the government. As for the reason behind the tragic incident goes, the Karnataka CM said that prima facie poor quality of work seemed the cause for the disaster. Assuring action against all those responsible for the disaster, Kumaraswamy said that a team of experts will look into this. He, however, ruled out a judicial probe. Stating that the state government was capable of conducting a speedy probe, Kumaraswamy said, “We will bring the culprits to book and provide due compensation to the victims and their families.” “Regional Commissioner Tushar Girinath has already ordered a magisterial inquiry into the disaster. Action will be taken based on the outcome of the probe,” he added. Meanwhile, Deepa Cholan, Deputy Commissioner, said that three more people are trapped in the debris. “We have given oxygen and ORS to them. SDRF and NDRF teams are conducting a rescue operation, he added. An under-construction building had collapsed on March 19 in Dharwad’s Kumareshwar Nagar. The building is owned by Basavraj Nigadi, Gangadhar Shintre and Ravi Sobrad. Reportedly, the construction had been on for the last two years. The first two floors had around 60 shops which were operational. According to reports, at least 150 people were in the shops when the structure crashed.